SIARGAO! This particular island paradise is located in the southeast of the Philippines, under the municipality of Surigao del Norte. There are daily flights from Cebu and Manila via Cebu. Check Cebu Pacific Air for details and the possibility of other local airports. Travelling by car from Visayas or Mindanao will mean catching a ferry and isn’t as convenient. Siargao hadn’t really been on my need-to-visit-list, but my sister and her boyfriend convinced me to join them April 2017. I loved it so much, I went back in July with my husband. Both trips will fused here so expect extra tales. I’d love to move to Siargao forever, so more stories might come in the future. Let’s see. With no Siargao flights from Cagayan de Oro, we hit the road instead. We headed straight to Hayanggabon port as we had decided to first swing by Bucas Grande Island in Socorro which is also in Surigao del Norte. Hayanggabon and Surigao port are about an hour from each other by car. Two passenger boats departure from Hayanggabon,11 am and then 4 pm. Don’t miss the first one like we did, as it’s a long wait for the second one. Another option would be to hire a private boat for around PhP 2500-3000 (max 8 passengers). Luckily for us, we found a cheaper option. Some boatmen, taking passengers coming from Bucas Grande, offered us a ride to Socorro for PhP 100/each which was fantastic and a bonus for them too! It took an hour to reach Socorro. We stayed overnight at Anthony’s Seaside Guesthouse. The place was reasonable for the price and they have a kitchen for guests like us, who prefer to cook their own food. The owner recommended some boatmen to take us to Bucas Grande the next day and we paid PhP 3500 for the four of us. Coincidentally, they were the same boatmen who had taken us to Socorro. We left for Bucas Grande at 6 am with some ready cooked food, prepared the night before, after visiting the conveniently close market. The hotel owner had hinted buying snacks and meals on the way could get a little pricey. Cruising towards Bucas Grande revealed multiple islands and islets; dazzling formations, sitting up from the blue glass sea; amazing views that the artist nature had patiently carved over time and a reminder of why I leave my house and travel. 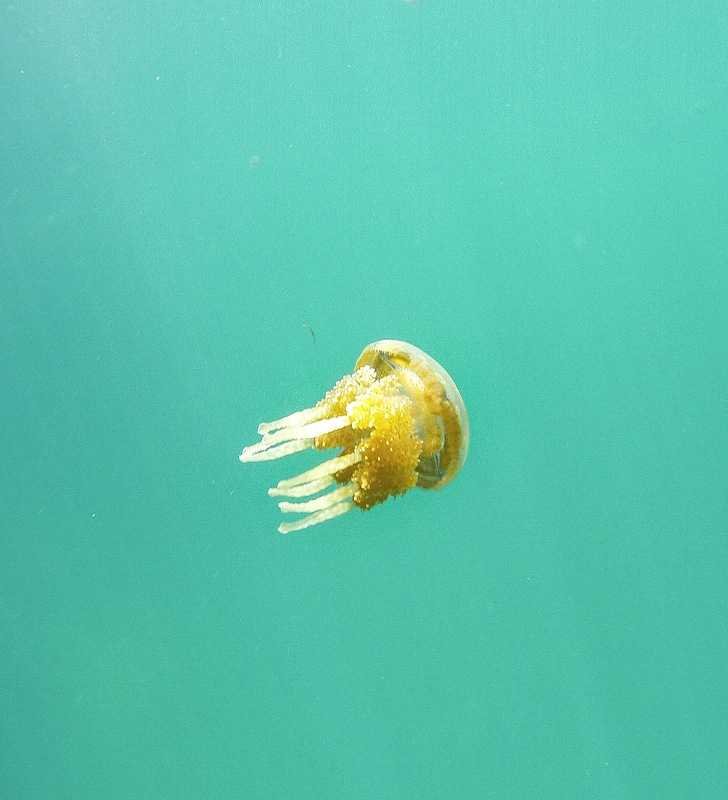 On Bucas, the four of us paid PhP 1800 for the Sohoton cove tour, popular for the huge school of sting-less jelly fish. There are a lot of caves to explore as well, but our time was too short for that. The tour started with low tide at 10 am. So while waiting for the tide we sailed to Marka-a beach for an early morning swim. We also had a smashing time snorkeling. Close by, we found another rock formation jutting from the sea, had another splash in the water, took photos and then climbed to the top for a better view of the other islets. We had a bite to eat on our boat and then headed back to see the jelly fish. In Cebuano, the word “so-oton”means to enter. That made sense when the boat was guided to the cove’s sole entry point, which was a wide tunnel with a low ceiling and only accessible at low tide. Sailing through the cove was nothing less than enchanting. We saw Islets covered with lush trees, all so serene and magical. We fell under the spell of this very special place. Our two guides first took us to Hagukan cave, but it had started to get busy so we opted for snorkeling instead. 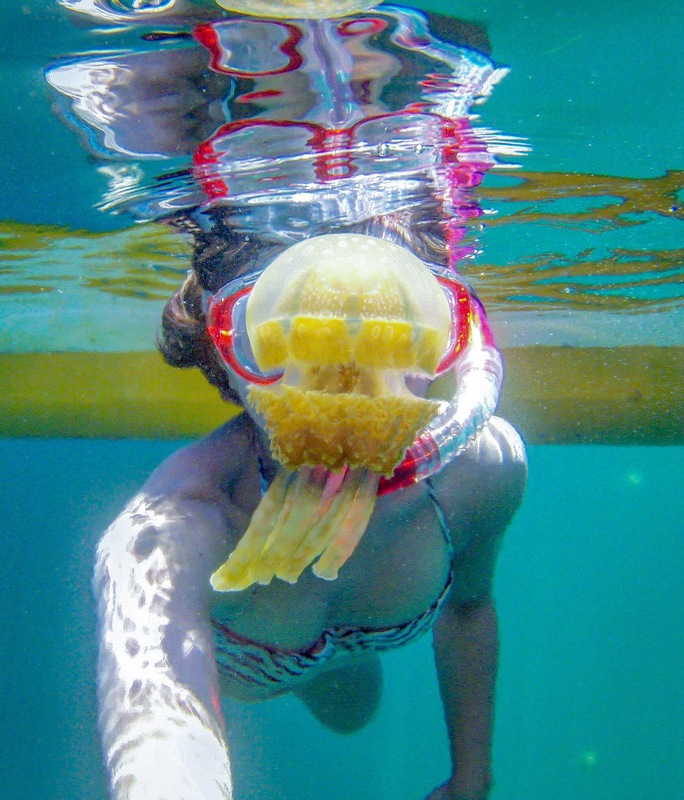 Snorkeling was fun, except when I let my imagination overtake me. The clear waters were so still and peaceful I couldn’t help but conjure fears of the ‘Syokoy’, a fish like humanoid who in Philippine mythology drags its victims down to the river/sea bed. Back on the boat and next stop the sting-less jelly fish sanctuary. We had a fantastic time swimming with the jelly fish. There were so many of them –baby ones to jumbo giants. It’s quite a deep spot and although the surface is broken by the reflecting shafts of sunlight, even the clear illumined waters fade to an impenetrable darkness. Certainly scarier than the place before, but this time I was having too much fun to care. Close encounter of my squishy friend. Altogether, our detour to Sohoton Cove was short, sweet and enthralling. Certainly worth crow-barring into an itinerary. From Socorro, the boatmen charged us PhP 1500 to General Luna, a popular area of Siargao. It’s usually PhP 2000 but I’m a great haggler. It was the same boatman too so they knew us already. On my second trip to Siargao I took a ferry from Surigao port. (Don’t get confused here, Surigao is the mainland port, Siargao is the paradise island.) Here are the ferry schedules to Dapa, the island’s main port. Tickets range from PhP 250-300 per way. From Dapa, it’s a 45 min trike ride to General Luna for about Php400, but remember, haggling is free! Some hotels in Siargao offer port transfers if you’ve already booked with them. Alternatively, you can hire a van for Php1000 to take you to General Luna. 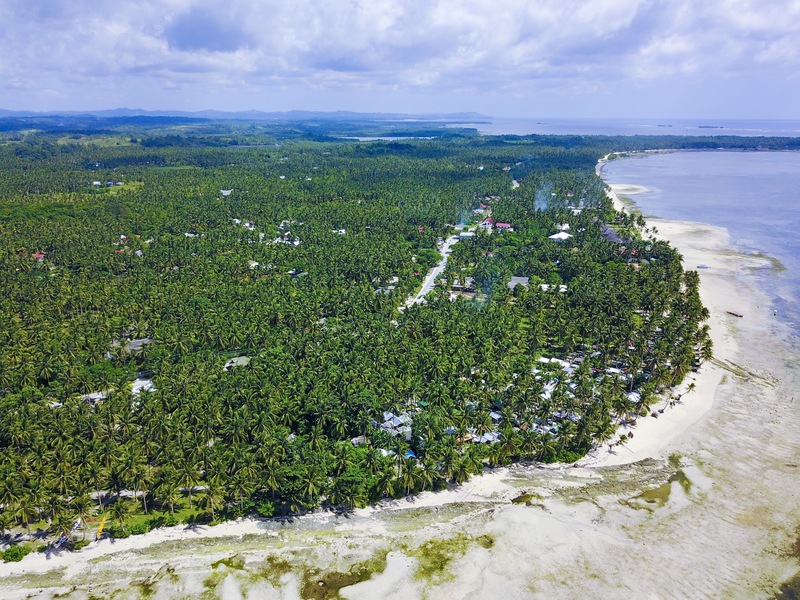 General Luna is the tourist hub of Siargao, with a variety of accommodation, cafe’s, bars, discos, restaurants, turo-turo food, surf shops, souvenir shops, and so on. You can also find the internationally renowned surfing spot “Cloud 9” here too. 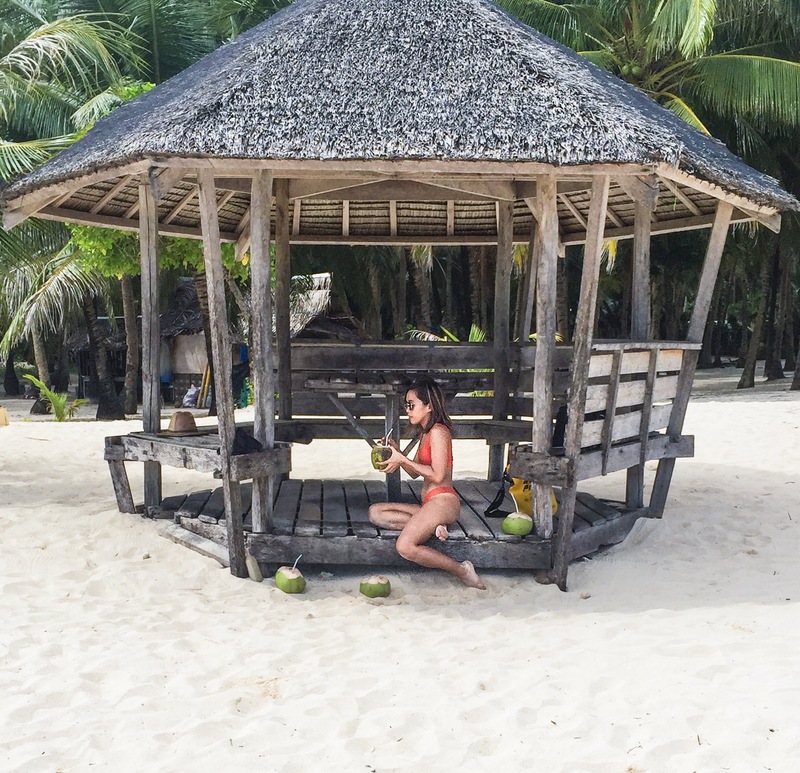 Siargao is packed with lovely coconut trees, so there was a good supply of our favourite healthy drink, buko, (young coconut). The Tower in Cloud 9. 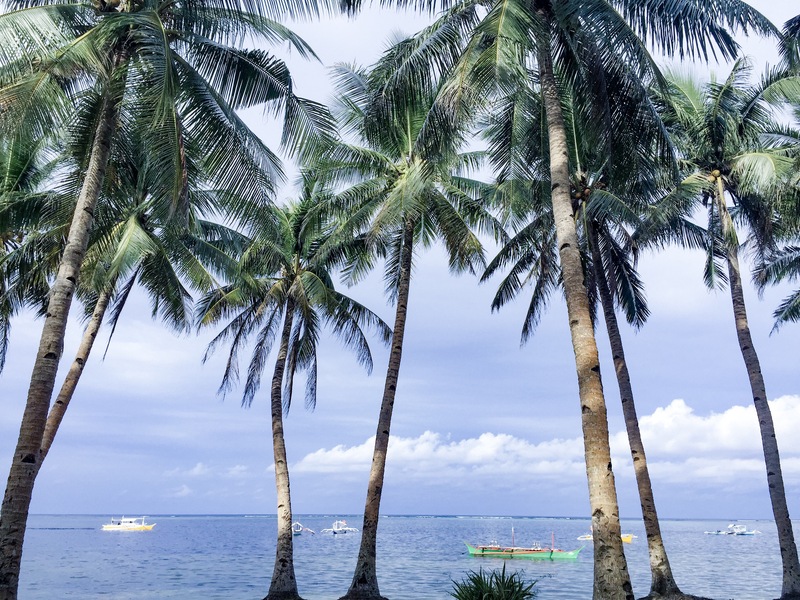 The island has an easy going, happy atmosphere, with warm and friendly people, even more than usual for the Philippines. There’s such a chill surfer vibe you can’t help but relax. 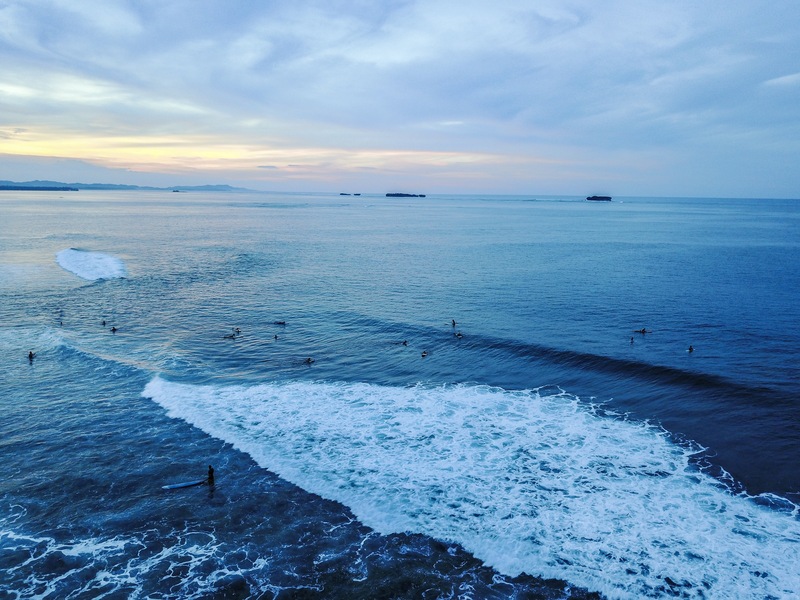 Don’t fret though, surfing is just a tiny part of Siargao, it has so many fantastic places to experience too. Trust me, once visited, the desire to return remains. 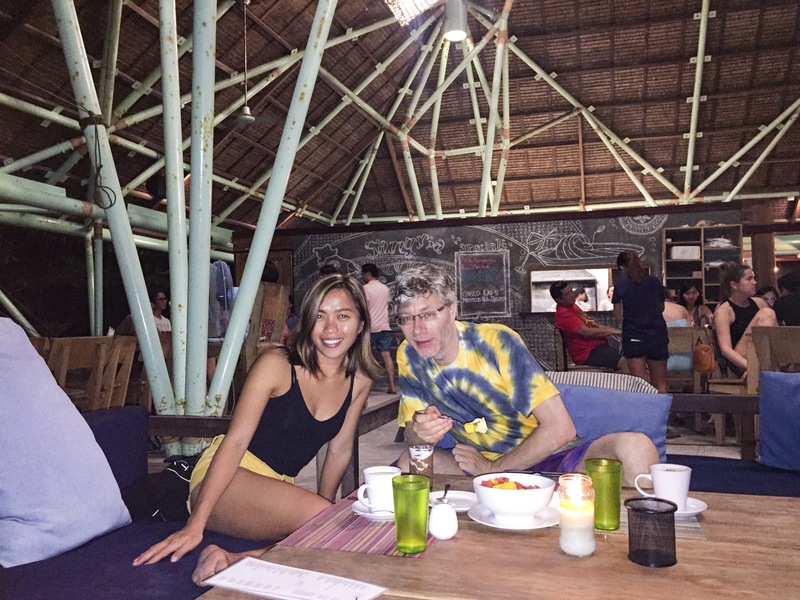 I’ve stayed in quite a few places in Siargao, and there are places to fit everyone’s budget. Located in General Luna and about 5-minute walk to the beach at PhP 1500/night for maximum of four people. This place is clean, cozy and spacious enough for four. The room isn’t air conditioned but has high ceilings and surrounded by plants, which keeps it cool and feeling fresh. The Swiss-Filipino owners live next door ready to attend to guests needs. They also have their sweet little boy, Kenji who welcomes you with flowers he picks from their garden. For bookings try- Tiki Bungalows and Bar’s Lofthouse. Located in General Luna and run by a Filipino family, I stayed in one of their fan rooms at 300 a head per night. Shower and toilet were communal and the room itself needed smartening up. It’s about a 10 minute walk to the beach. They serve a variety of food choices which are reasonably priced. They also provide surfing lessons and board rentals. For more details, visit their website Jing’s Place Homestay. Located in General Luna, owned by a Filipino family. Stayed here for two weeks at PhP1500 (ac room), but prices vary without notice. Went through Agoda then Travelboook.Ph which was actually cheaper than booking at the front desk. The restaurant was mediocre but there is a nice little swimming pool which is literally a step away from the beach, with sunbeds perfect for sunbathing. Staff are helpful and really friendly here too. Their website-: Cherinicole Beach Resort. Morning dip in Cherinicole guest-exclusive pool. Poolside drama with my gumamela. Located in General Luna, next to the famous surfing spot, Cloud 9. At PhP 500/night for a room with a fan which has an en-suite toilet and shower but the room needs proper ventilation as it gets too humid. The walls were literally coated in condensation in the morning. For enquiries, visit Wayfarers Cloud 9. I would have loved to stay in Harana, Kawili and Kermit, as I’ve read good reviews about them, but they were fully booked I suggest you book ahead of time especially during peak surfing season. You can get around on a rented bike for about PhP 350.00/day or even for shorter journeys on a bicycle for PhP 120.00/day. We rented a van for the longer road trips at PhP 2500.00/day. Warning! Be careful renting a motorbike, some lack maintenance. My sister and her boyfriend had a burst tire which sent them sprawling. Fortunately, they received only minor injuries. However, the very same thing happened to a Spanish couple we befriended on our second trip. Thank goodness they were also spared any serious injury. So be extra careful, especially as helmets are rarely provided. Buko break in between cycles. Surfing Siargao turned me into a lover of the surf. Such exhilarating fun riding the foamy waves. It’s definitely worth a go. If you’re a newbie I highly recommend hiring a surfing instructor. For as little as PhP 500 you get a board and one-on-one help for a good hour. It’s well worth it. In no time they will have you standing up on the board, riding the surf. Practiced surfers can hire just the board for PhP 200 per hour. After our very first surf. At Cloud 9, waiting for waves at dawn. Still happy after gulping a lot of seawater. Naked, Daku and Guyam Islands– the treasure being their beauty and in that sense they truly are, precious gems. To island hop you need a boat, which normally costs Php 1500, but as usual I haggled it down to Php1400. It’s up to you which order you see the islands but generally it’s Naked first, then Daku and finally Guyam. Naked Island is a 10-minute boat ride from General Luna. 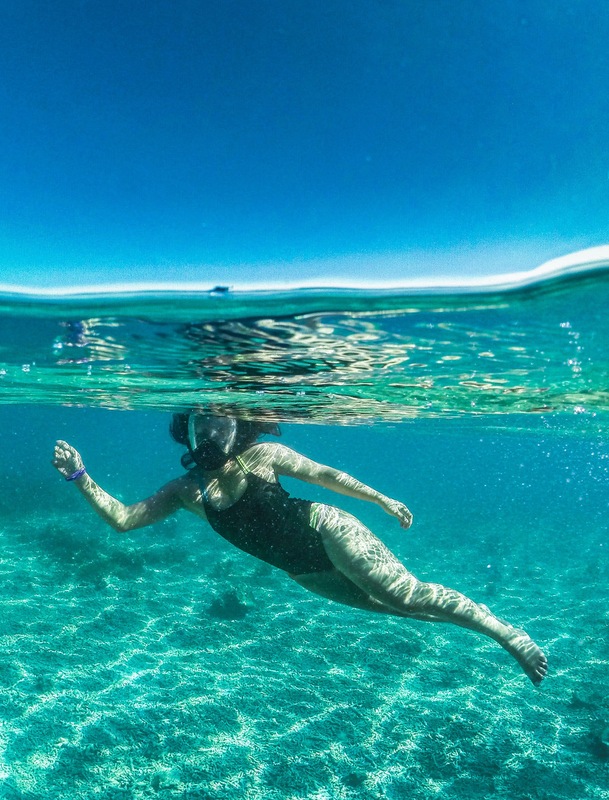 Like all the islands, it sits in the crystal clear waters of the southern Siargao sea. Best visited in the early morning or a few hours before sunset when It’s quieter and cooler. Don’t forget to bring sun protection, as its blisteringly hot during the day and being naked, there’s no canopy to hide beneath. Getting our first layers of tan. It’s a tiny island, and all of it beach. You won’t spend long here, just time enough to walk its perimeter, take a swim or pose and nail that instagrammable bikini shot. With a wide open sky and no aerial obstacles, it’s also perfect for drone pilots like myself. To busy droning to care for lovers early morning island cuddle. Daku Island was next. It’s a larger island and its name means big. There’s a gorgeous stretch of beach- white pristine sand and the same clear swimmable waters.This island has dense coconut palms soaring into the sky. From these, the locals will sell you the best bukos to keep you hydrated and well quenched. You can also play volleyball here and then dunk yourself into the crystal water to cool off quickly. Daku is the only island among the three where you can get food. You can bring food or buy it there and for a fee they will cook it for you. However, buying from the market in GL would be slightly cheaper. Daku Island and all its glory. Guyam Island is a beautiful round drop in the ocean and sits right across from General Luna. It has it’s perfect beach as expected but volcanic rock formations make up the rest of the shore, visible when the tide recedes. This island is an ideal spot to end the hopping. There are areas on the sand where you can relax under lush leafy trees and the place has a quieter, secluded feel. It’s good for swimming and snorkeling too. And again, you can buy bukos here, though are less abundant than on Daku. Under its towering lush palms. It’s a a fairly long way to both of these places and the van is by far the most comfortable and safest way to get there. Sugba Lagoon is nestled in the thick mangroves of Caob Island in the north-western part of Siargao. It’s about 50-60 minutes drive from General Luna to Del Carmen which is where boats to Sugba Lagoon can be hired. The 30 minute boat ride is a fixed fee of PhP 1600 for a max of 6 people, entrance fee is PhP 50 (locals) and PhP 100 (foreigners). Best make an early start before things become busy. Siargao has the largest mangrove forest reserves in Mindanao, where large saltwater crocodiles lurk in murky residence. The water did seem to be potentially perilous, though, we never actually saw a croc. The journey is beautiful but arriving in the lagoon is stupendous and always leaves me breathless in awe. It’s a truly unique and serene spot, tucked away in an out of the way place but certainly worth the journey. Frustratingly it’s all too brief and despite my desire to spend a whole day here, each boat is only allowed four hours to reduce crowding. The locals here sell food but you can always bring your own if you want. Tables are also available at PhP 50.00. They have paddle boards and kayak for rent at 200/hour and the bamboo raft for PhP 100.00. Life vests are also available for non-swimmers at PhP 50.00. “Sugba” is the Cebuano term for Grill. Long ago, a man came to the lagoon seeking shelter in its thick forest. He built a fire from wood and even burned plastic which mother nature did not like. To show her displeasure towards the human polluter, a creature, summoned from the lagoon’s depths, captured the man and grilled him alive on his own fire. A funny tale but I guess it makes sense. Whatever harm we do to our environment will harm us in return. One warning though, the grilling you have to watch out for is that which the sun does to you shoukd you stay out in it too long without protection. Magpupungko Rock Pools is located in the eastern part of Siargao. It’s located on the shoreline and about a 30-minute drive from Del Carmen and about an hour’s drive coming from General Luna. This natural rock pool has such clear blue water, spotting the different fish there is easy. It’s very deep in places so you can have fun jumping in of the rocks. It’s an all round great place to chill, swim, paddle, snorkel or float. The rock pools from above. This pool is only visible when the tide is low so be aware of the best times to go. They also have a beautiful beach where you can relax. There’s an eatery which serves food with beach tables shaded by palms. Snorkels can be rented here at PhP 100/each. Entrance fee is PhP 50/each. Heading back to GL we decided to swing by Tayangban Cave, it wasn’t the best time as the light was slowly fading. Nevertheless we still went, but only to swing and jump into the cold water. The cave was too dark to enter and had we not spent most of the day in the water already, we might have traveled its length. Corregidor in Casulian Island, is a about a 30 minute boat ride from General Luna. It is located in the southern part of Siargao waters. We joined a group trip thru @mysiargaoguide at PhP 1500/person all-in. You can sign up for the trip Bravo Resort (Cash and credit payments). All on board for Corregidor. The trip to Corregidor includes a short hike, so bring a pair of walking shoes. Like all the islands, Corregidor is also surrounded with crystal clear waters and has lots of coconut trees like Daku Island. This island hasn’t quite become popularized yet but it’s likely to in the future. We saw trees being cut which our guide, Inna, explained was to clear space for a resort. After a light snack and some refreshments we started our 30 minute each way hike. As we stood atop the highest point of Corregidor the view was magnificent. We could see all the surrounding islands around this southern side of Siargao. We didn’t stay on the top too long, just enough to chat and drone before we sizzled under the rays. Back at the shore we threw ourselves into the tremendously inviting seas and felt immediate refreshing relief. Be mindful swimming, as my husband got his toe spiked by a giant urchin. A bountiful lunch spread was prepared for us and some fruit too. It was really good especially being with new friends. We just spent the rest of our time there swimming, snorkeling, chatting and having a lot of fun. It was a pleasant stress-free trip as everything was fully taken care of by the organizers . We even got the chance to drop by Naked Island on our way back. 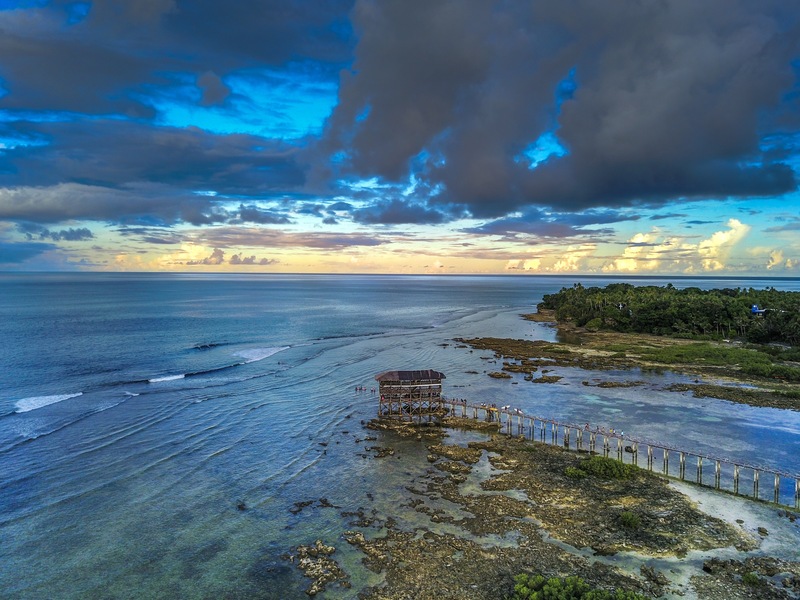 Doot Beach is located on the tip of a peninsula in the most southerly part of Siargao. It is about 10-minute “habal-habal” ride from GL. This is yet another beautiful serene secret spot to laze during the day, perfect for picnics and also a great place to fly drones over the beautiful mangrove spread of the island. Best to bring some food here as there aren’t any food places close by. Where we love to eat in Siargao! BRAVO! It’s commodious, nicely placed and friendly. They specialize in truly mouth-watering yet simple Spanish cuisine. Their comfortable sofa beds make a slouch of me after a busy Siargao day, or even a lazy day. I love the healthy drink options and my favourite is, Revitalize, which is a freshly squeezed mixture of watermelon, pineapple and cucumber/apple juice. The food here, from starters to desserts is really fantastic! My husband’s all-time favourite is baked Lapu-Lapu and I have a penchant for the Peri-Peri Chicken, Taco Poblano and the super chocolaty mousse. This is a beach front restaurant so you can go swimming anytime you want or slip into their dipping pool with a G/T. We always leave with a hefty bill, but it’s always worth it. RUBIE’S STORE in General Luna, is a semi-sheltered convenience store that also sells turo-turo food. We like to eat lunch here as its great value and contrasts to the expensive but delicious fare in BRAVO. They sell tasty Philippine cuisine here for a fraction of the cost of any restaurant. Try their meatballs, they’re super morish! They also sell fresh fruit and general grocery items. CAFÉ LOKA is located at Cloud 9. They serve a variety of healthy drinks and smoothies where you can mix and match ingerdients to suit your preference. I love having my afternoon teas here, relaxing in the hammock, reading my book, chatting away to anyone who will listen or maybe flying my drone across the gaudy backdrop of the burning sunset. ‘A chilled vibe’ is an understatement. Having some afternoon tea while droning and chatting to fellow tourists. MAMA’s GRILL is the barbecue haven in Siargao. Food is tasty and affordable. They offer grilled meat (pork, chicken and fish) and the healthier option of a vegetable skewer. This gets really busy, so go early to avoid waiting although it’s a quick turnover so the wait is never too long. 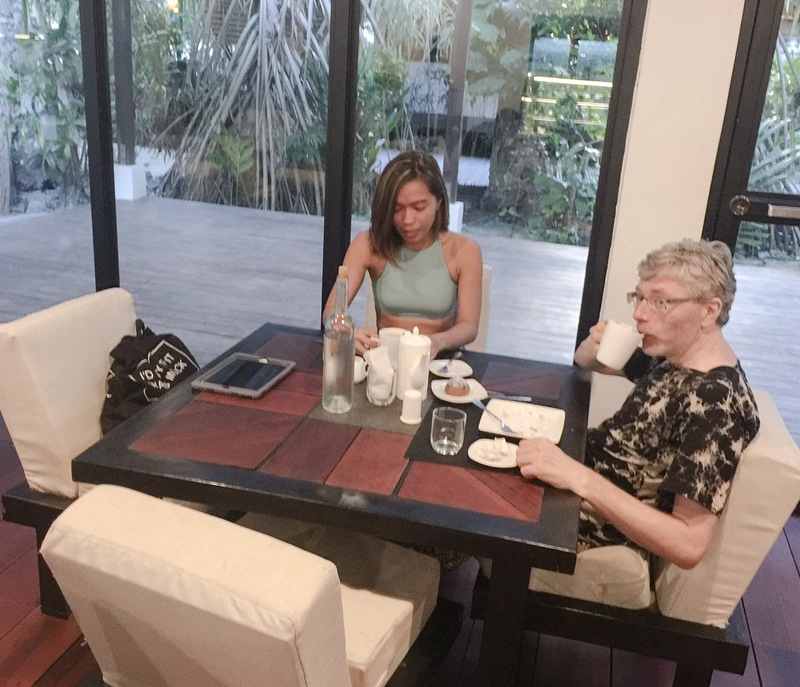 KAWAYAN GOURMAND is French patisserie in Kawayan Siargao resort and a stone’s throw away from Cloud 9. It’s a pleasant cafe with a good selection of pastries. It’s home baked and easy to nibble through far more than intended.They also serve coffee, tea and some cold beverages. I hope they include decaffeinated coffee tea in the future though. And oh! This is where I first spotted the island’s famous long boarder and my bikini-girl crush, Lea Goeson. There are a lot of food venues in Siargao like HARANA SURF for example, which serves authentic Philippine cuisine with a modern twist. It has a warm, casual atmosphere with lots of distinct and interesting areas to chill. The food tastes good and is fairly priced. Shaka is another place, popular for its food. Their menu includes the colourful and healthy “power bowl.” Unfortunately, I never actually tasted one – something to try on a future sojourn to Siargao no doubt. There are three cash machines in Siargao as far as I know, two in Dapa and one in Del Carmen, just a few steps away from Del Carmen port. These three are quite far from GL, but there is a PALAWAN pawnshop in GL where you can get over the counter cash using your ATM Card. They charge PhP 40 for every PhP 5000 withdrawal. I think they also accept foreign cards, but charges may vary. Leaving something too beautiful for words like Siargao has always been dreadful. But both holidays have been really fantastic and we were going home with amazingly wonderful memories and experiences and of course, with our perfectly tanned skin. See you soon IAO!